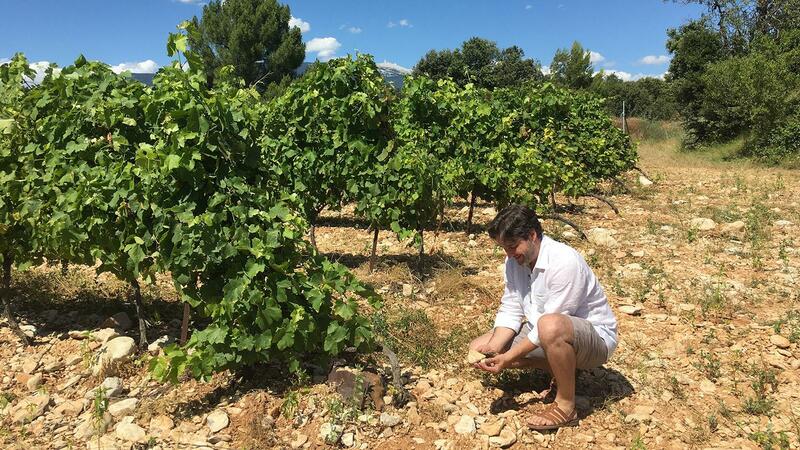 Frédéric Chaudière shows the stony soils at Château Pesquié, where Syrah, Grenache and other traditional Rhône varieties thrive. Château Pesquié, which sits northeast of Avignon within France’s Rhône Valley, looks and feels like a place that has produced fine wines for ages. Lined by centuries-old, leafy plane trees, the drive up to the estate leads to a noble, 18th-century stone farmhouse surrounded by gurgling garden fountains fed by natural underground springs. Behind the house begin the manicured old Grenache vines. About 250 acres of organic vineyards spread over the foothills of Mont Ventoux, known as the “Giant of Provence,” its landmark, wind-whipped, white limestone peak reaching to more than 6,200 feet. How could they not make great wines here? Indeed, Pesquié has received more than a dozen 90-plus-point scores for its Syrah- and Grenache-based reds and Roussanne-Clairette whites. Fresh, exuberant and fruit-driven, these are some of the best examples of today’s Ventoux AOC bottlings. Pesquié's Provençal-style château, dating to the mid-1700s, sits above two underground springs, which keep the grounds lush. Yet Ventoux wines remain generally obscure—the poorer cousins of the prestigious Southern Rhône family. “Ventoux was seen as a cheap value wine that you served a little chilled, and that didn’t have much ambition,” says Frédéric Chaudière, 38, who has run Pesquié since the mid-2000s with his enologist brother, Alexandre. Nowadays, the sleepy appellation is waking up. Though more than a dozen local cooperatives still lead Ventoux wine production, the number of independent producers here has ballooned to more than 100, with several—Pesquié among them—leading the push for higher quality. On the east side of the Rhône Valley, sprawling southward from around the tiny Gigondas and Vacqueyras appellations, Ventoux’s more than 14,000 acres of vineyards benefit from higher elevations, cleansing breezes, a blazing southern sun and cool summer evenings. Mont Ventoux, visible on the horizon, influences the region's climate, partly sheltering the vineyards from the mistral—the strong, cold wind that blows through the Rhône Valley. The appellation has a perfect formula for an exciting wine scene: a crazy mix of soils—from blue marl to red iron-rich clay to snow-white limestone—and affordable prices for vineyards, at about $12,000 an acre. Syrah and Grenache thrive here, along with Cinsault, Mourvèdre and Carignan—used for both red and rosé blends—with a handful of other red varieties playing supporting roles. The whites are dominated by Bourboulenc, Clairette, Grenache Blanc and Roussanne, with smaller quantities of Marsanne, Vermentino and Viognier. “When you look at the geology and the different soils, the different elevations, the grapes and expositions, the toolbox is infinite,” adds Chaudière, who is also vice president of AOC Ventoux. On one parcel, Grenache grows in lighter colored soils with large pieces of broken limestone; on the adjacent parcel is Syrah in dark-brown, pebbly, alluvial soils. Like Ventoux, Pesquié is a work in progress. The Chaudière brothers are still learning and evolving. Frédéric and Alexandre grew up at Pesquié, which their maternal grandparents bought in the early 1970s, when the Côtes du Ventoux AOC (now simply Ventoux AOC) was created. For many years, the family sold their grapes to a local cooperative. Then in the mid-'80s, the brothers’ parents, Edith and Paul (whose father was an enology professor), left careers as a physiotherapist and a speech therapist, respectively, to learn about wine, gradually taking over the estate. With the 1990 vintage, they produced their first wine in their own cellars. For Pesquié's range of reds, whites and rosés, Frédéric Chaudière explains, he and his brother have aimed for a lighter touch in the winemaking. In 2002, Chaudière, who had studied history and philosophy and was embarking on a career as a documentary film narrator, returned home to help at the winery because of his father’s health problems. He never left. A few years later, he was joined by his younger brother, who had studied enology. The Chaudière brothers have expanded vineyard holdings, moved to parcel-by-parcel vinifications and refined their lineup; including their Paradou brand, that now stands at six reds, four whites, two rosés and the sweet fortified Muscat de Beaumes de Venise—totaling 50,000 cases of wine—spanning about 10 varieties, including a Chardonnay. In recent years, they have moved to a fresher style, with gentler extractions, more whole-cluster fermentations and aging in neutral large barrels and cement tanks. Climate change, leading to generally hotter and drier growing seasons, may also be helping Ventoux. “It was challenging in the 1980s to have ripe fruit; now we have no problem, but with some of the highest acidity in the south,” says Chaudière.